I first started writing about The 7 Stages Of Disease back in 2009. At that time, I was devastated with the news about Farrah Fawcett's losing battle with cancer, rumors about Steve Jobs suffering from cancer and the death of my own brother-in-law from Stage 4 colon cancer. Over the last 2 years, I have continued writing about it, on and off. This is the final installment of The 7 Stages Of Disease series, which is long overdue. Please note that all the information in this series are not mine, but are based on the book 'Fit For Life : A New Beginning' by author Harvey Diamond. Please get this book and read it - I highly recommend it to anyone interested in good health and in preventing the dreaded cancer. For those who have never read my posts on this topic, and to help refresh the memory of those of you who have read them, here then are the links. I shall wait for you to read them. Now that you are familiar with the first 5 stages of disease, let us proceed to the next stage. When the body creates an ulcer to rid itself of toxins, it will then try to heal the ulcer by replacing the tissue where it has been lost. This scarring of tissues, is called induration. The hardening of tissues is done with a purpose, and that is to encapsulate the toxic material that is threatening the health of the person. By trapping the toxic material in a sac of hardened tissue, the body is in fact quarantining the toxins and preventing them from spreading freely throughout the body. This sac is often diagnosed as a lump or tumor, but it has still not reached the cancer stage yet. Induration is the last stage during which the body is still in control of its cells. If we continue to practice a destructive, unhealthy lifestyle that has brought us to this stage, the cells in our body will start to 'go crazy'. They will become parasitic, living off whatever nutrients they can obtain, but contributing nothing to the body in return. The constant poisoning has finally altered their genetic encoding and they become wild and disorganized. When cells go wild in this manner, the condition has reached Stage 7, the final stage, which we called cancer. At this stage, cells are no longer under the control of the brain, but are multiplying wildly in an unorganized manner. Although there is a chance that cancer may be arrested or reversed if diligent and concentrated effort is taken with a healthy regimen, the best way is still to prevent it from happening in the first place. Why prevention? Because up to this day, medical science have yet to find a cure for cancer. If you want to know the TRUTH about modern cancer treatments, read HERE. The whole purpose of me writing about The 7 Stages Of Disease is to create an awareness that you can actually prevent cancer. At any stage from 1 - 6, you have the ability to reverse the progress of ill health and return to vibrant health. Do not wait till you have cancer before you take action. 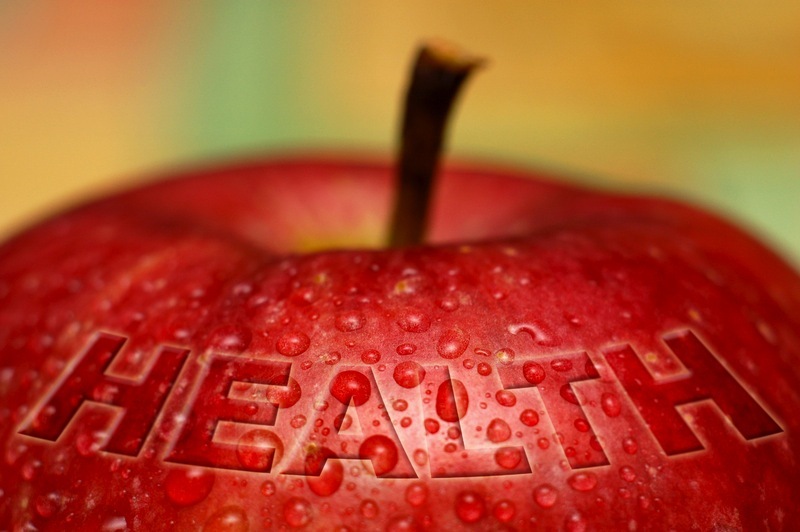 Live a healthy lifestyle today. After visiting Madame Tussauds Bangkok at Siam Discovery, my friend and I walked over to Siam Center to ponder what to eat for dinner. 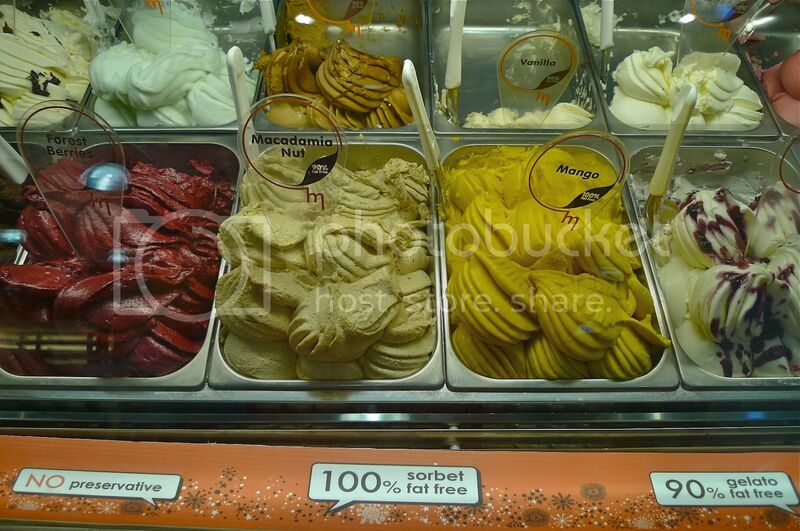 While window shopping inside Siam Center, we came upon a gelato shop on the 4th floor of the shopping mall. It's called Melt Me. Looking at the wide array of flavors available, I sure wanted to melt them with my tongue! LOL! What attracted me to this shop was the seemingly 'healthy' gelato! 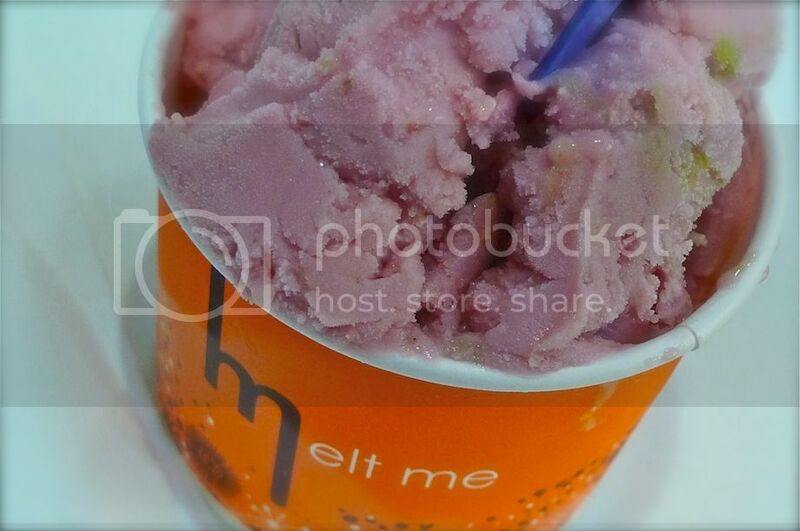 No preservatives, 100% sorbet fat free and 90% gelato fat free! I wanted to choose the macadamia nut but in the end my friend chose that while I went for the wine strawberry. After finishing with the gelato, we decided to try some Isaan street food near the Victory Monument landmark. So we took the Skytrain from Siam Station to Victory Monument Station. I can tell you that food hunting in Bangkok is easy with the BTS Skytrain and MRT underground train. There is hardly any need for taxis! 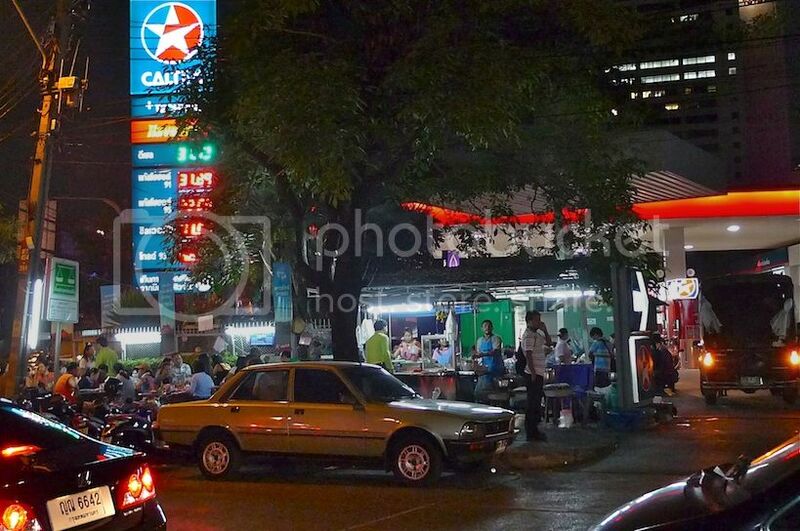 We found this stall next to the Caltex petrol station at the corner junction of Rangnam and Ratchaprapop Road. When we were there, there was already quite a number of people queuing up in front. Most of the tables were taken. So we just ordered our food and waited for our turn. Luckily we did not have to wait too long. We got our table after about 15 minutes. 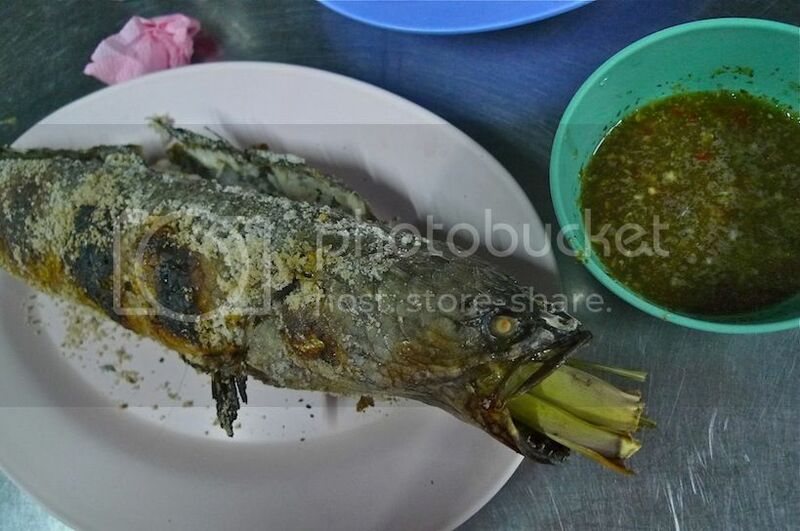 Isaan food, to my understanding, is food originating from the NorthEastern region of Thailand. It is basically Thai cuisine incorporating spicy and savoury dishes, in which sticky rice and greens are served. My friend and I both ordered a plate of som tum (green papaya salad) each. It was good, but nothing extraordinary. 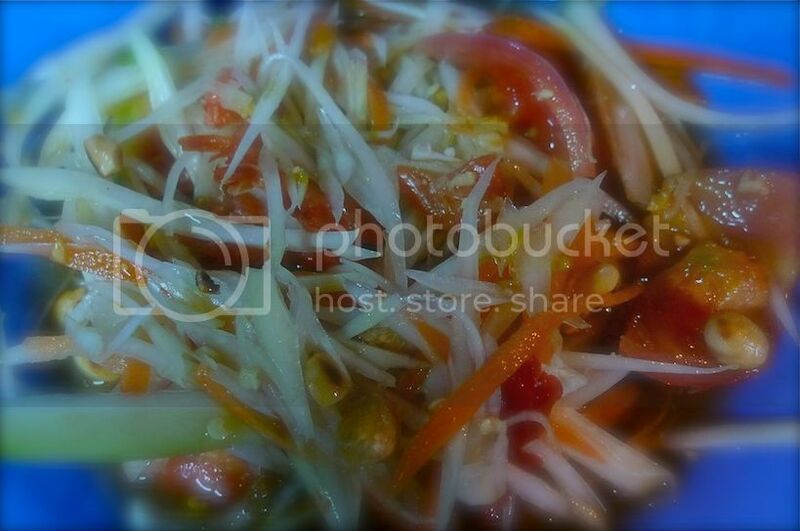 Just a good, spicy som tum which I like! They also gave a plate of raw vegetables (sorry no photo) which I dipped into my som tum's sauce. Yum! Felt so healthy eating it. Haha! 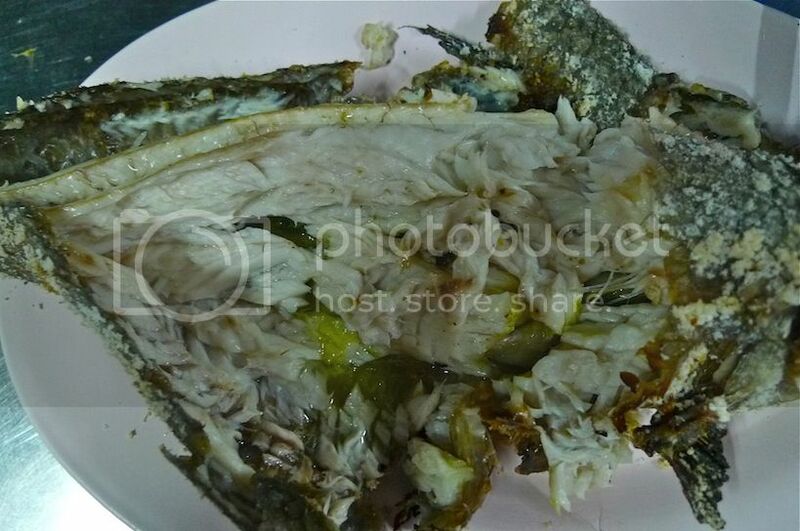 We also ordered a pla duk yang (grilled catfish) each. The fishes were grilled over hot coals and brought to our table together with 2 bowls of nam jim (Thai chili sauce), one for each of us. Look at the natural fish oil glistening on the flesh! Yummy! Of course, it's not so much about the catfish but the chili sauce that came with it! 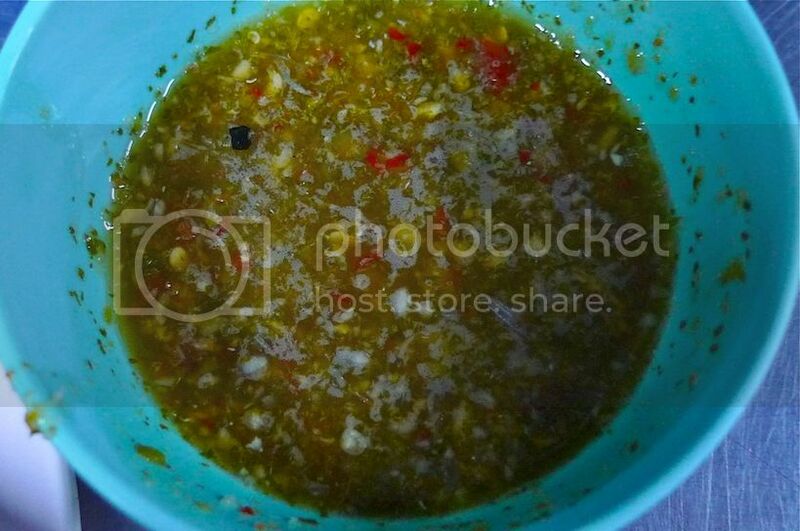 Dip the fish inside the chili sauce and you will be amazed! The nam jim was spicy, slightly sourish and tangy! Probably a tad too spicy for me, as I ended up drinking iced Coke in between my mouthfuls of fish. But I had no complaints, as it was simply delicious! The dinner costs us each 170 baht (RM17) - 50 baht for som tum, 100 baht for pla duk yang and 20 baht for iced Coke. The raw vegetables was complimentary. Really not bad considering the size of the fish, which was quite huge. If you ever go to Bangkok, don't miss this place unless you can't take spicy food! Directions : Take the BTS and get off at Victory Monument Station. Walk along Phaya Thai Road heading away from Victory Monument roundabout. When you see 'Eat Am Are' corner lot restaurant in front, turn left into Rangnam Road. Walk till the junction of Rangnam and Ratchaprapop Road. The stall is on your right next to Caltex petrol station. I have been to Bangkok a few times already but I never get tired of this city! What is so charming about Bangkok that makes me want to re-visit it again and again? Perhaps it's the people, the food, or the culture that attracts me. Or perhaps it's the combination of them all. Anyway, here are 5 amazing things I like about Thailand. Last January, I was in Bangkok again for a short holiday. 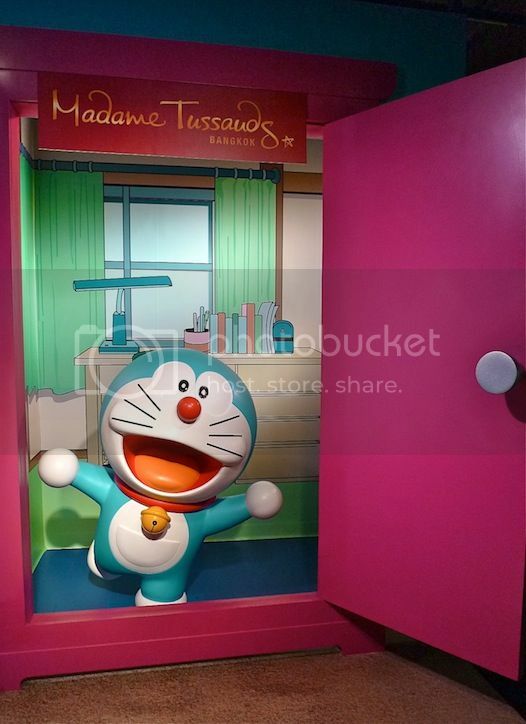 If you have been following my blog, you would have already read about my visits to Terminal 21, Madame Tussauds Bangkok and Mansion 7. During this latest trip, I discovered a new thing that I like about Bangkok. Can you guess what it is? Well, every night, when I returned to my hotel room, I would switch on the TV and watch Thai dramas! Yes, believe it or not, I suddenly found myself addicted to Thai TV! LOL! Me, who grew up watching Hong Kong TVB dramas are now into Thai dramas? It must be quite a shock to anyone who knew me. Haha! I think the Thai drama I watched is called Tomyam Lamsing, if not mistaken. I googled and managed to find this show on YouTube! Here's an excerpt from one of the episodes of the show. The show did not come with any English subtitles so I was actually quite amazed with myself for being glued to it for a few consecutive nights! LOL! Maybe it's the good looking actors and actresses that made me watch, but really, I thought they had pretty good acting skills too! Like these two pretty Thai actresses! I think they are both singers as well. And after the Thai drama, I would stayed up till 2am, just to watch Thai MTVs! Yes, there's something about Thai music videos that made them so interesting to watch. Luckily, my friend is a night owl like me and he did not mind. Haha! Here's a Thai music video for your enjoyment. There was one night at about 2am when I heard and liked this particular song a lot and I wanted to record it using my iPhone. I turned up the TV volume so I was able to have a clearer recording. Guess what happened halfway my recording? There was a sudden loud thud from behind the wall! The guest in our neighboring room must have gotten annoyed with our loud music and threw something onto his wall in frustration! Oops! I immediately lowered the volume after that! LOL! Here's another Thai music video you might enjoy. I have tried to search for the music videos on the Internet for some of the songs I heard during my stay in Bangkok. Unfortunately, due to not knowing how to read Thai language, I could not find them. But one of the songs I heard inspired me to compose a Thai-flavoured pop song on my piano. I recorded my own playing one afternoon and here it is! I have no title for it so I simply called it "A Thai Pop Song." Haha! But I think it's a song about love between a boy and a girl just like the music videos you saw above. Note : The above recording is copyrighted. Now all I need is a lyricist to come up with the lyrics, a musician to help me add in other instruments and a good singer and I have a song ready for the charts! Haha! By the way, anyone from Thailand reading this? If you feel that this song sounds like a Thai pop song sang by a female singer, you are correct! I think I was influenced by the first two lines of the chorus from that song as that's the only part I remember! LOL! 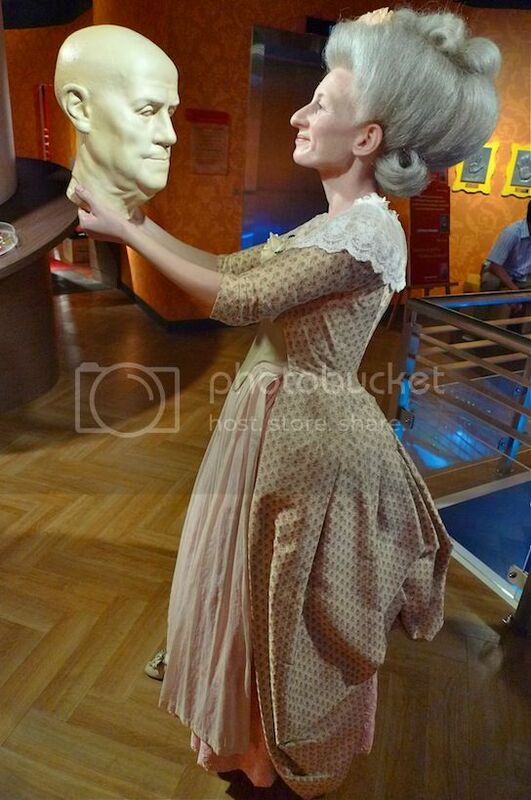 There are currently 14 Madame Tussauds outlets around the world. The 15th outlet which is slated to open in Jakarta by end of July this year will be the largest Madame Tussauds outlet in South East Asia. When will it be Malaysia's turn? 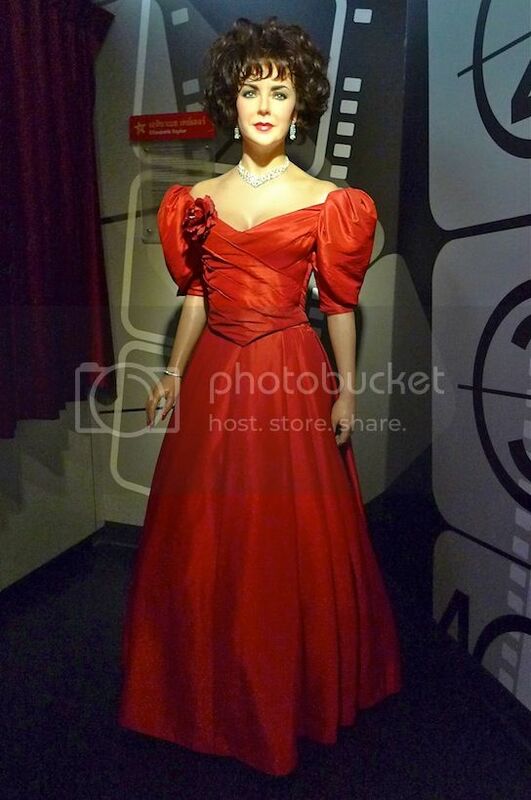 This is the wax figure of Marie Tussaud herself! 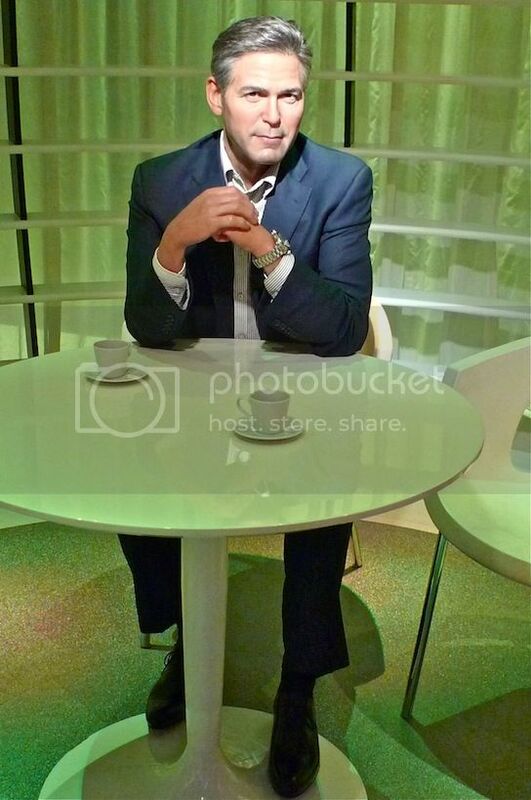 I took this photo at Madame Tussauds Bangkok. 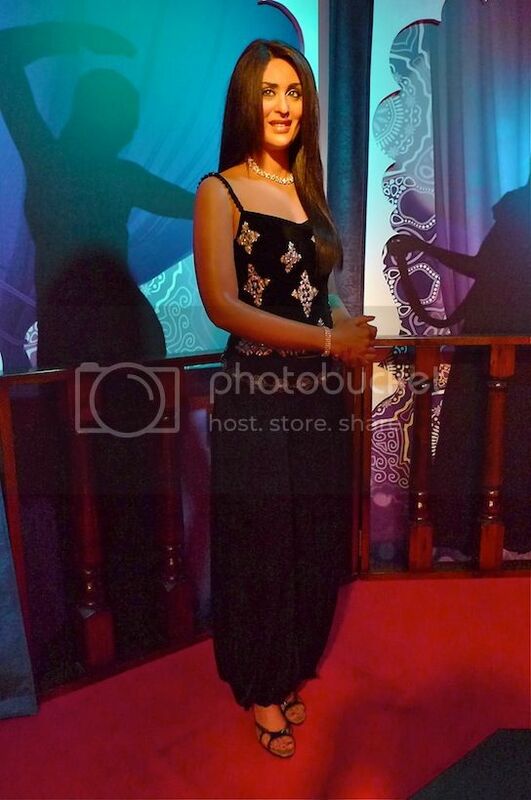 There were not many people at Madame Tussauds Bangkok during my visit last January. 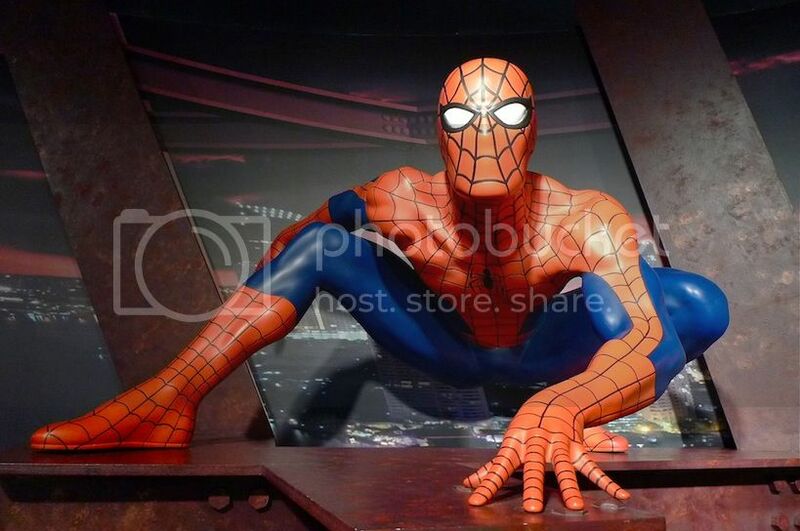 Thus, I was able to take photos of most of the wax figures without too much trouble. 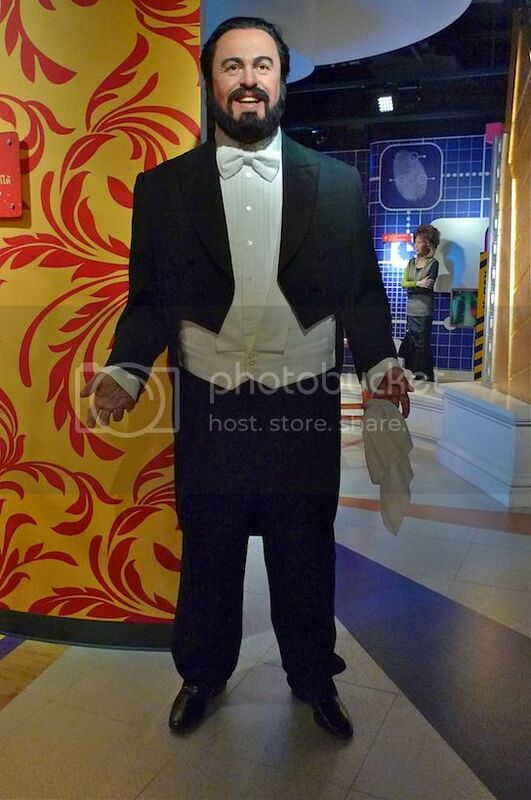 Here is the wax figure of Britney Spears. Looks like the real thing to me! 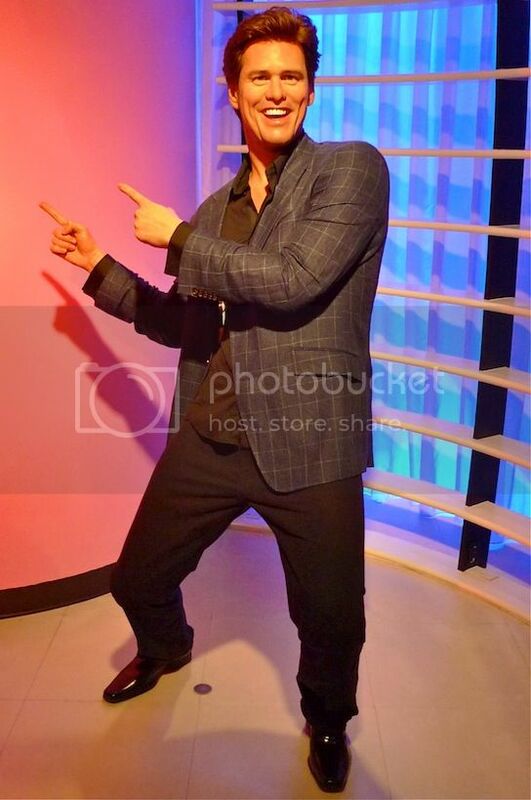 Madonna has the exact same pose I saw in Madame Tussauds Hong Kong. Surprisingly, Lady Gaga was placed far away from these female singers! But I think I will put her photo here before I move on to the actors category. Oh by the way, did you know that Lady Gaga is actually quite short? I found that I was way taller than her when I stood next to her. What's more, she's wearing high heels! LOL! Luciano Pavarotti, the late Italian operatic tenor who had successfully crossed over to pop music. Now do you know who this is? 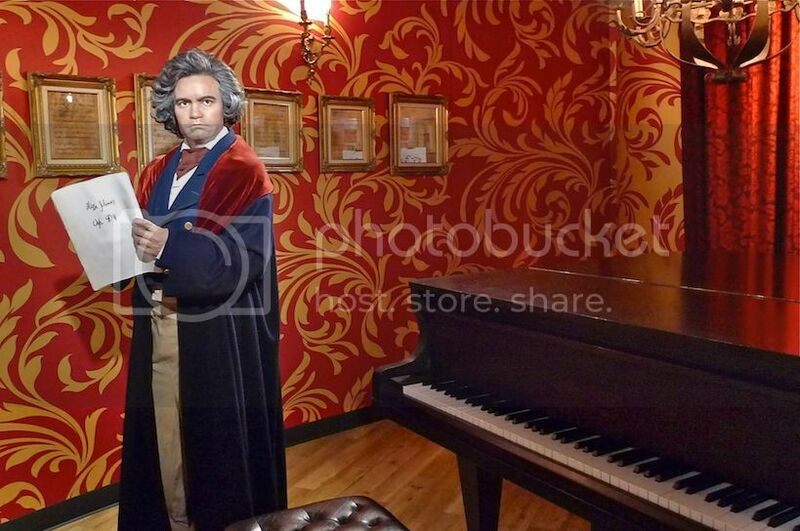 He's the famous 18th century German composer Ludwig van Beethoven. If you are into classical music like me, then you will love his compositions! What I really admire about him is that he was still composing music despite being completely deaf in his mid-forties! Moving on to the next category - actors, actresses and anything that has to do with TV and movies. 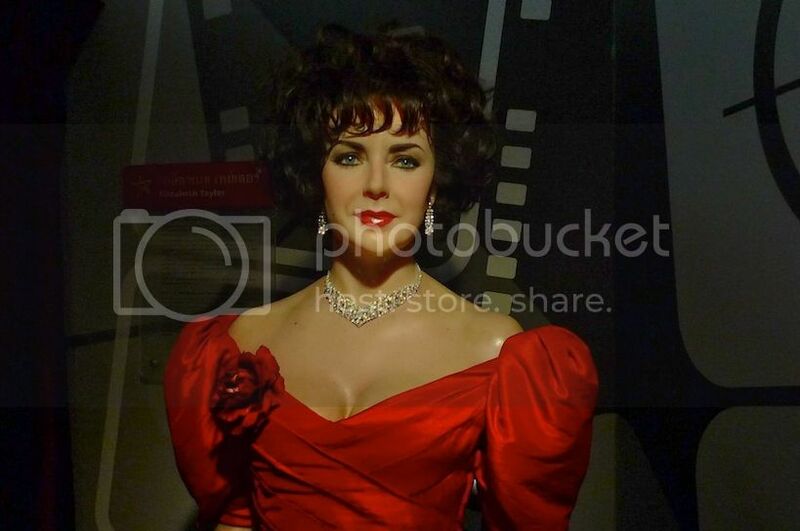 Here's the wax figure of Elizabeth Taylor. Don't you think she looks stunning? I was not familiar with Petchara Chaowarat, but it seems that she's an iconic leading lady during the 'Golden Age' of Thai cinema, and was known for her round, pool-like eyes and elaborate hairstyles. 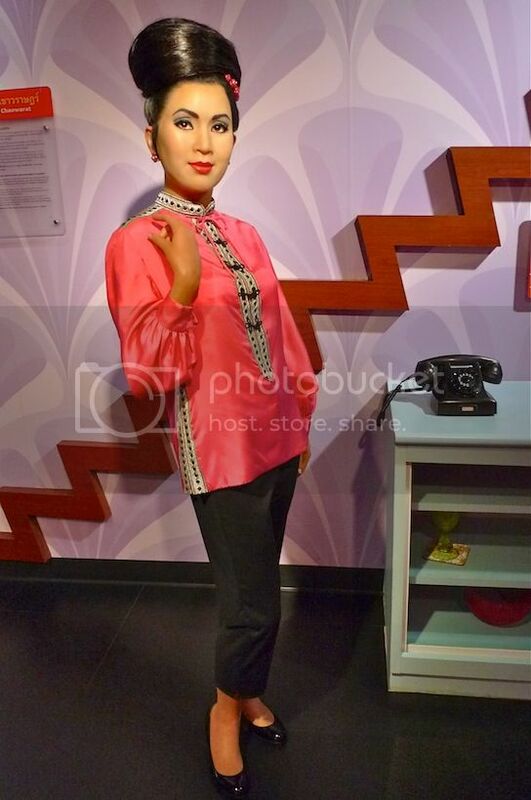 She acted in over 300 films in which half of them, she co-starred with popular leading man, Mitr Chaibancha who was also featured at Madame Tussauds Bangkok. I guess the both of them must be the leading screen couple during that time! 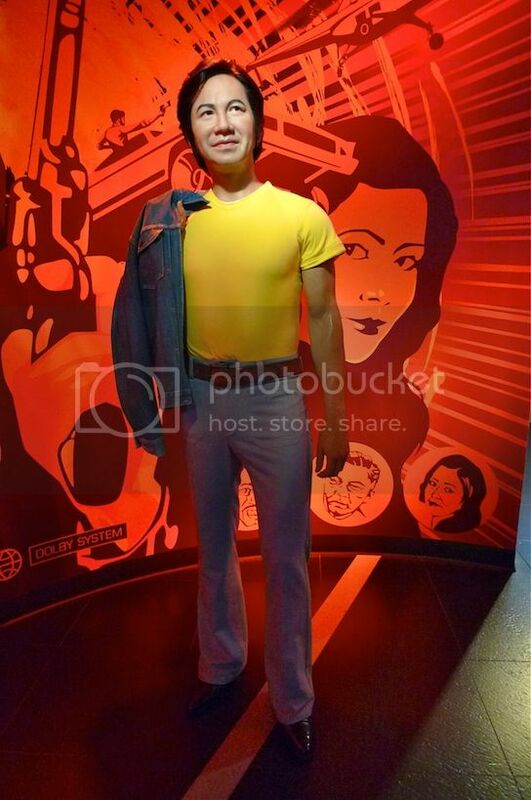 Another famous Thai actor, Sombat Metanee also had his wax figure displayed here. This action star who performed most of his own stunts, had at one time held the Guinness World Record for the most film appearances at over 600 films! 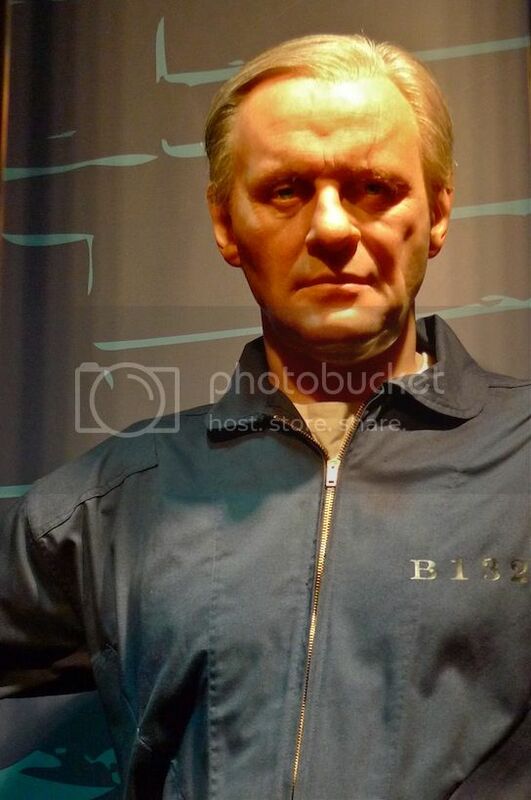 Who would have forgotten about the cannibalistic serial killer Hannibal Lecter played to perfection by Anthony Hopkins? Here, he was standing behind bars, but I took a close shot of his face, expecting him to lunge forward at any minute! 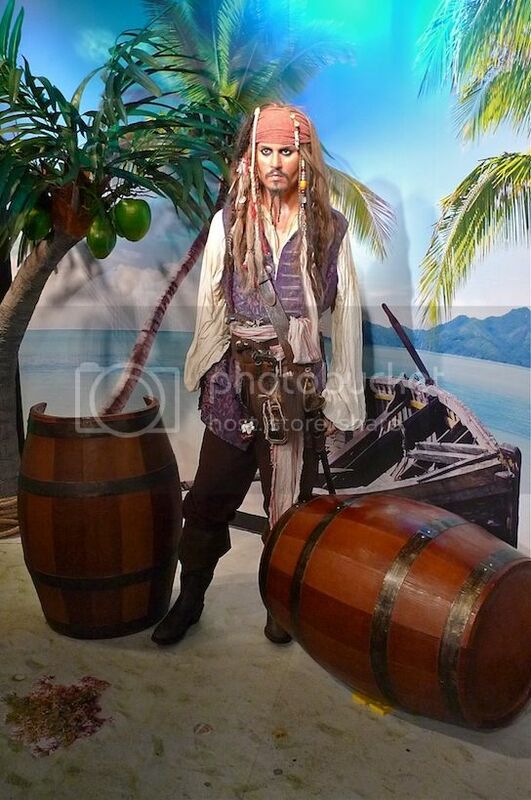 Johnny Depp looks amazing as Captain Jack Sparrow, his character in Pirates of The Carribean. 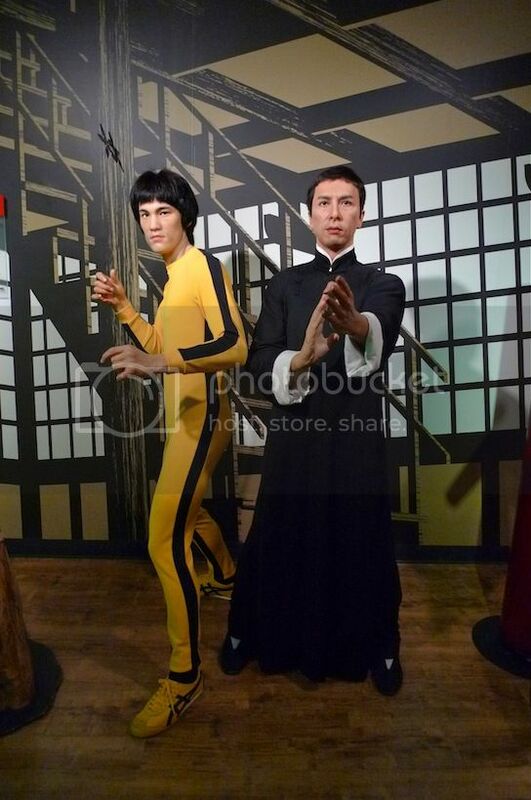 Two of the world's most famous martial arts film actors, Bruce Lee and Donnie Yen (both from Hong Kong) standing side by side in their characteristic poses. 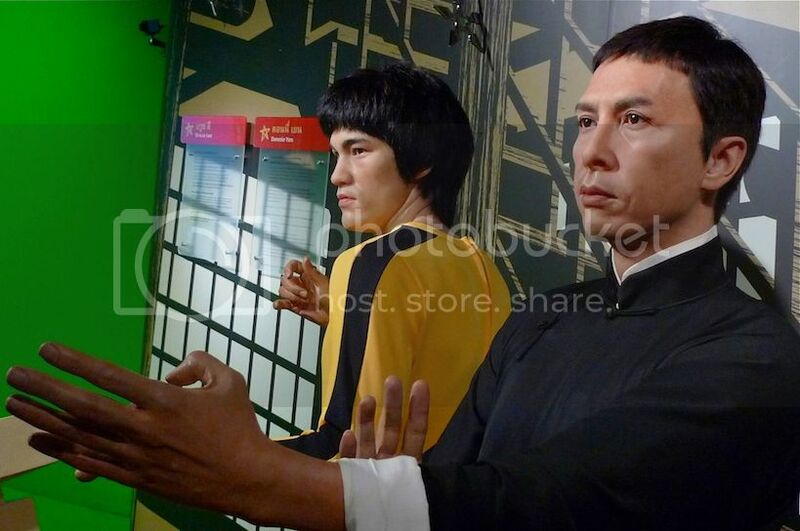 I must say Donnie Yen looked very realistic here - it's amazing! 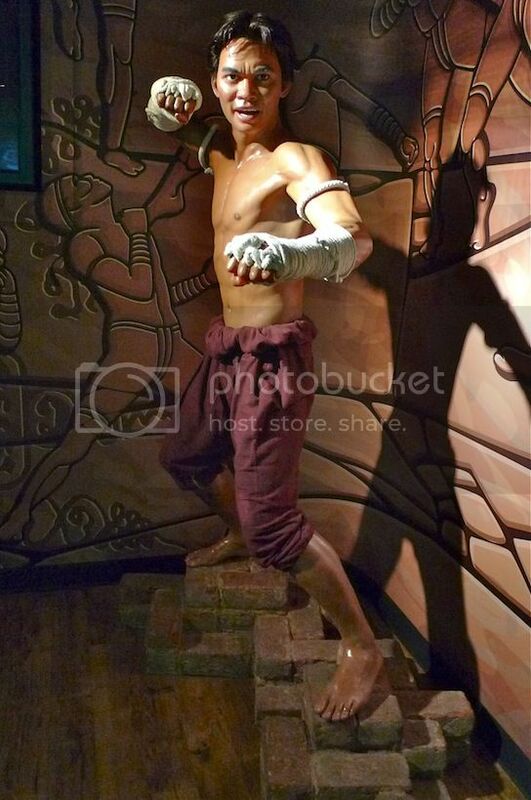 Another martial art actor from Thailand, Tony Jaa, who shot to international fame with the movie Ong Bak. Did you know he actually became a Buddhist monk 2 years ago? Now that he had left the monastery, expect him to star in more action-packed movies in future. OK, guess who do we have here? 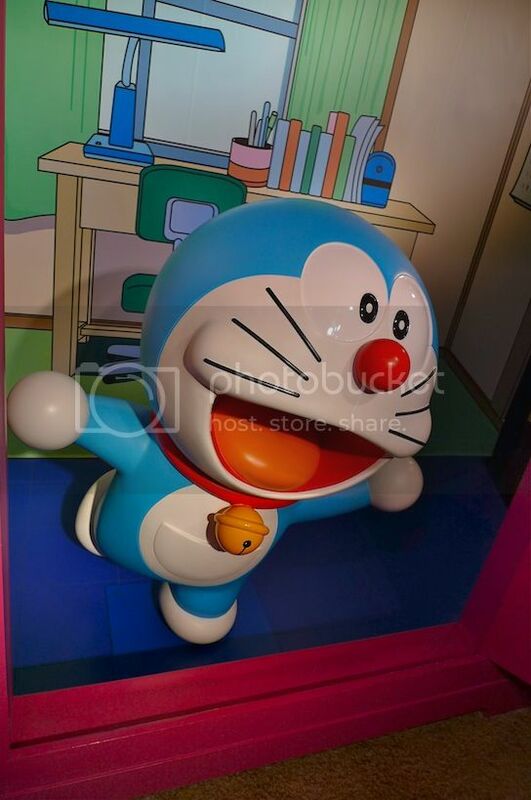 Believe me, I never in my life expected to see this popular Japanese robot cat at Madame Tussauds! Have you heard of anyone by the name Pancake? Well, there's a very famous model in Thailand with this nickname. Her real name is Khemanit Jamikorn. Winner of the Thai Supermodel and Model of the World contests in 2004, Pancake had since became one of Thailand's most popular actresses. Oprah Winfrey looking good here. Could not take a better view of her as some people were blocking. Next were four famous Bollywood stars. 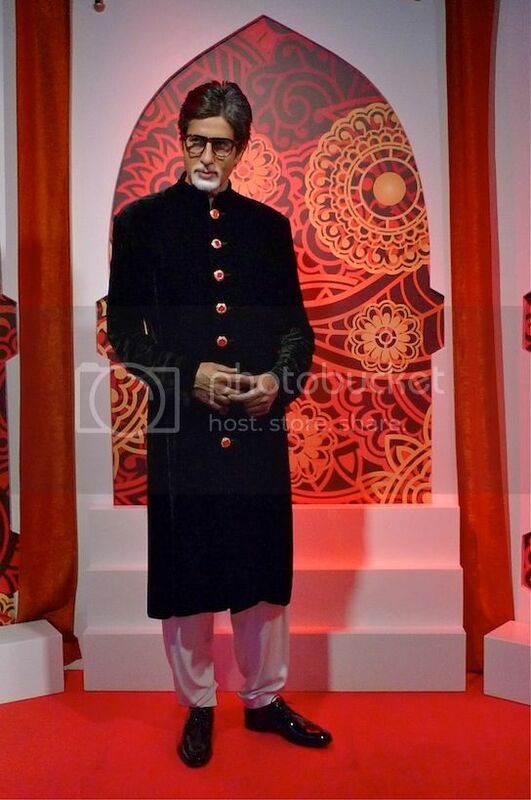 First there's Amitabh Bachan who needs no introduction. 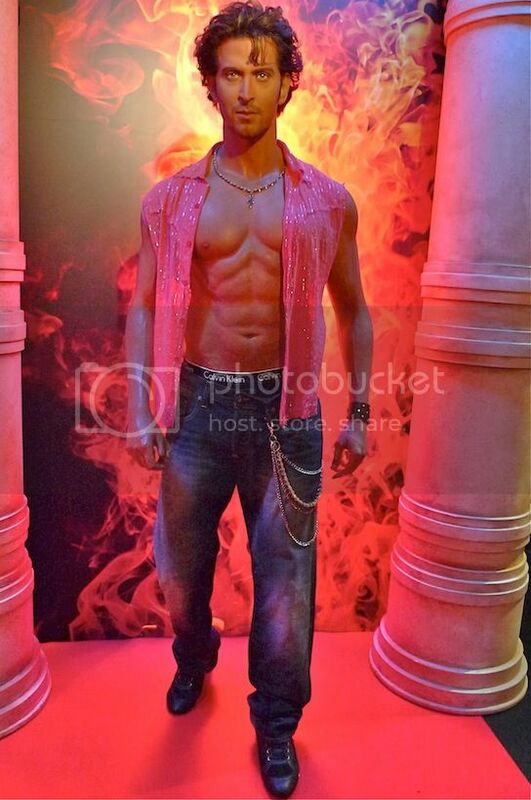 Hrithik Roshan who received wide critical acclaim for his role in movie Dhoom 2, one of the most successful Bollywood movies of all time. Kareena Kapoor, a leading actress in many Bollywood movies. Done with Bollywood, let's move on to Hollywood! Still remember Kate Winslet in Titanic? She was quite chubby that time. Well, she's much slimmer now. 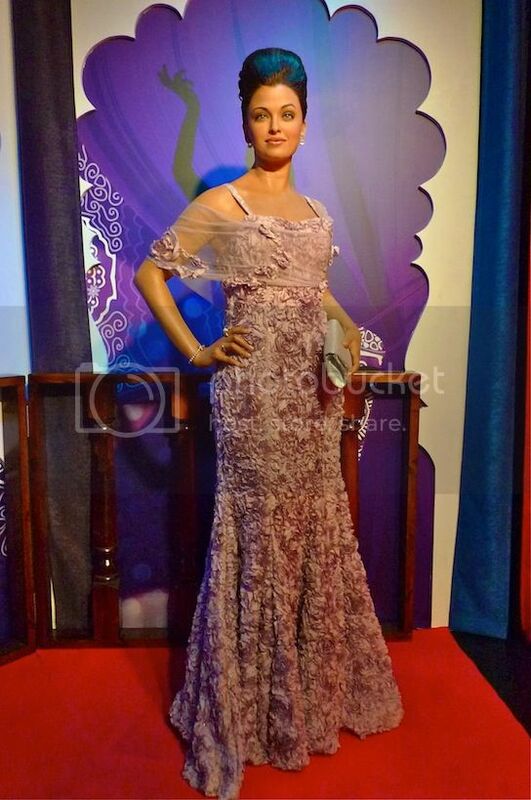 Or at least that's what her wax figure portrayed. Jim Carrey, famous for his slapstick comedies. Nicole Kidman, looking really good here as if she's an image in the mirror. 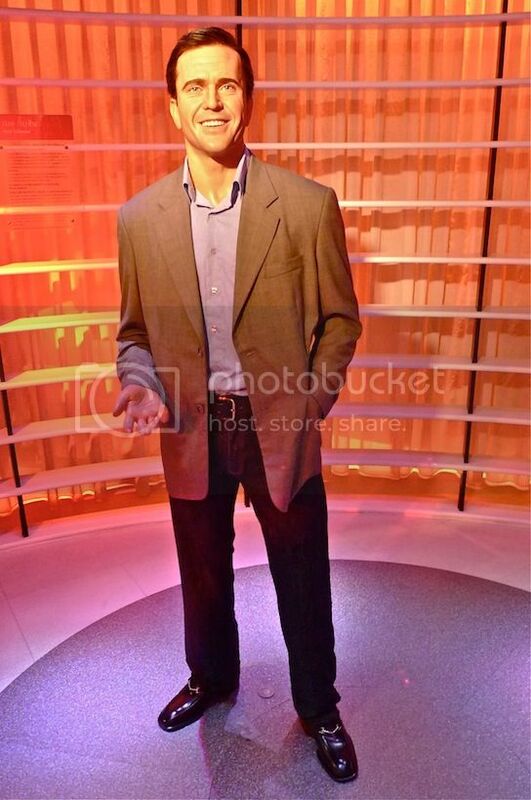 George Clooney, looking smart and suave. Actor, director and producer Mel Gibson, who created lots of controversies with his anti-semitic remarks, and allegations of racism and domestic violence. Our very own Michelle Yeoh. 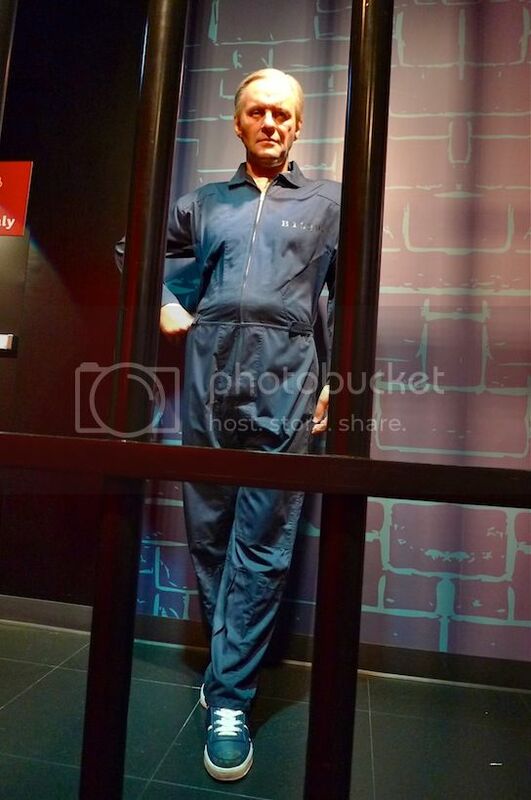 This one is different from the one I saw in Madame Tussauds Hong Kong. 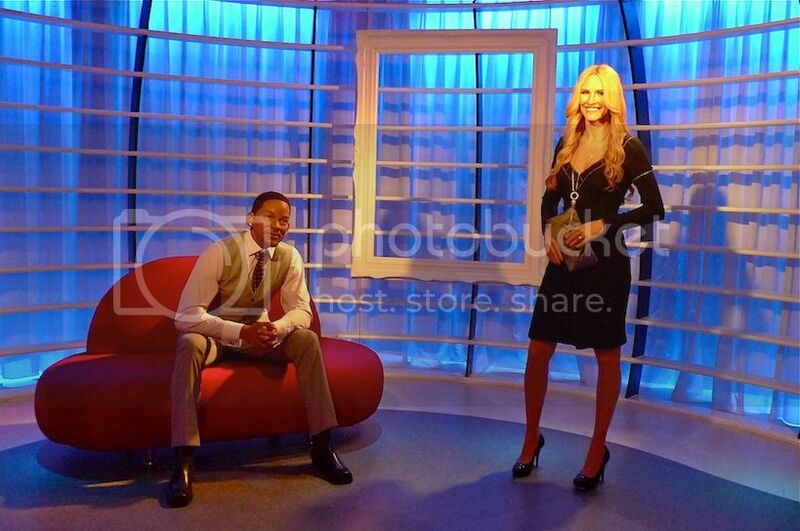 I was quite impressed with Will Smith and Julia Roberts here! The background lights kept changing and I took another shot of Julia Roberts with a green background. 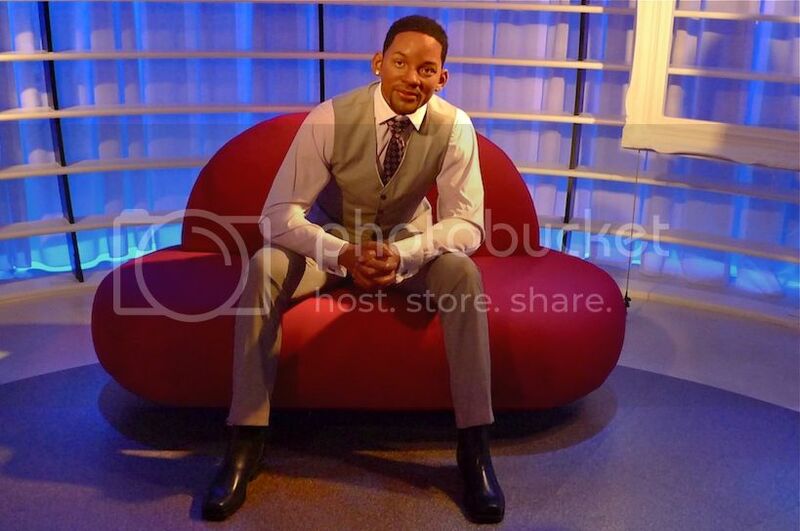 Will Smith looks quite real to me! What do you think? Finally, the best is left for the last. My favourite couple, Angelina Jolie and Brad Pitt! Don't they both look awesome? 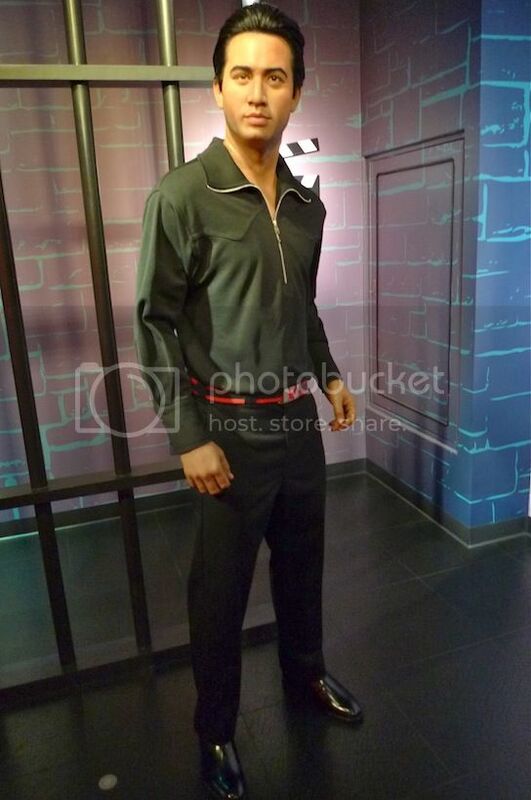 Just like President Obama, both Angelina Jolie and Brad Pitt are so popular that they are featured in every single Madame Tussauds outlets around the world!